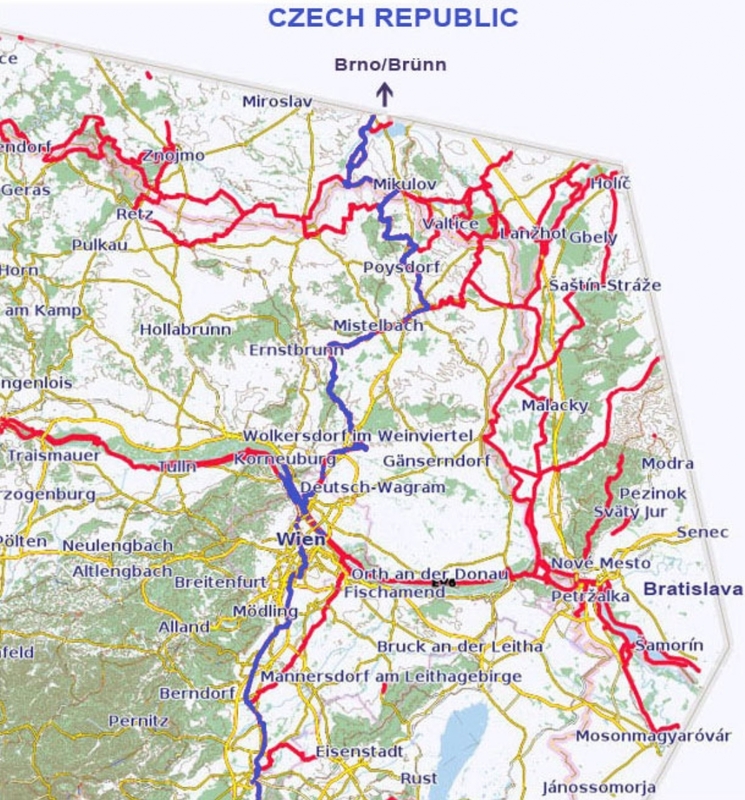 EuroVelo 9 or the Amber Route will be almost 2,000km long when it is finished. It is so named because it follows the old amber trading route between the Baltic coast at Danzig in Poland and the Adrian coast near Trieste. At the moment only the approximately 560km between Brno/Brünn in the Czech Republic and Maribor in Slovenia (with Vienna almost exactly in the middle) are complete. pedalpower in Vienna is ideally situated to help you organize this trip. The route takes you from the Czech border through gentle rolling hills of Austria’s Weinviertel (Wine Country) to the Vienna Woods to one of the most beautiful cites in Europe, Vienna. South of Vienna you reach the thermal spa region of Styria before crossing the border to Slovenia. It is possible to plan any number of days as you can at any time ride to the nearest train station and in a short time be back in Vienna. An easy 1½ train ride from Vienna to Brno brings you and your bike to the starting point. 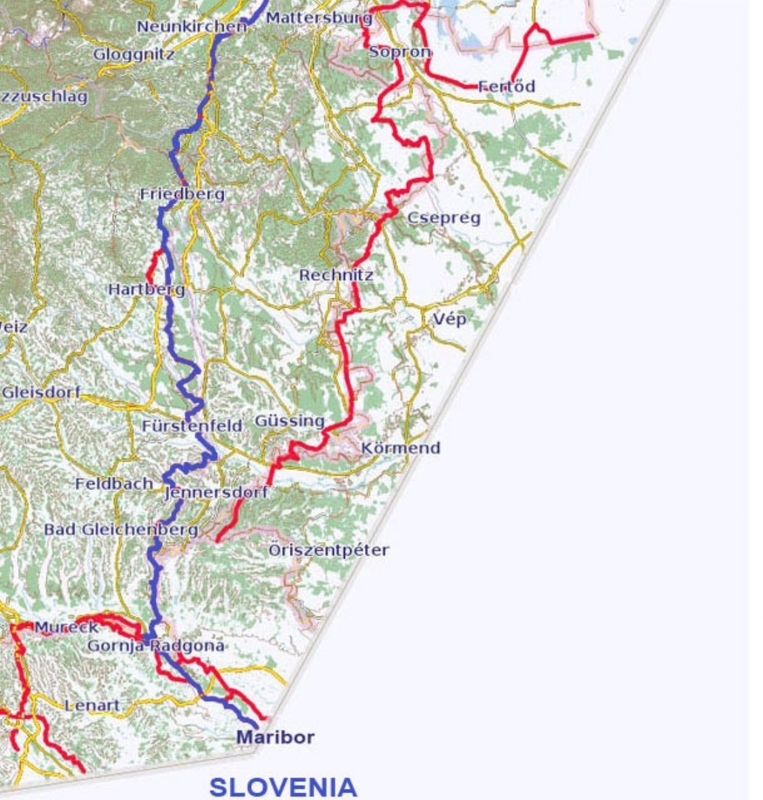 The first half of the route from Brno to Vienna is about 230km. The second part from Vienna to Maribor is about 330km and a 4½ to 5 hour train ride will bring you back to Vienna. We can help you reserve train reservations for your bikes – they are absolutely necessary! Definitely buy the bikeline EuroVelo 9 Österreich (Austria) (Esterbauer Publishing Company). It should be available on amazon. This is invaluable with its maps, and list of places to stay. Unfortunately it is only in German but this doesn’t matter with the maps or the list of places to stay by town in the back of the guidebook.